Short films from the Middle East, Europe, Australia and USA have taken out the top awards at this year’s Uni Shorts International Student Film Festival held by Performing & Screen Arts (Creative Industries) at Unitec Institute of Technology in Auckland, New Zealand on Saturday 27 October. Auckland schools swept the New Zealand Secondary Schools section. Seventeen-year-old King’s College student Quinn Dacre took out the top prize for his animated short, Acceptance which he drew himself on 1000 post-it notes. Runner up was Intensive Care, a documentary about New Zealand’s health system from the point of view of a South Auckland-based doctor, directed by Western Springs College student Donald Mayo. Screen journalist and NZ Web Fest founder, Keith Barclay, who judged this year’s entries, was impressed by the winning film: “The commitment required to complete a film like Acceptance is huge, so kudos to a teenager for sticking with it – and for producing a well-told story,” he commented. A film about a young boy looking for salvation in a European refugee camp took out the Best Fiction Postgraduate Award. Aamir was influenced by Tisch School of the Arts student Vika Evdokimenko’s own experience as an immigrant. Barclay commented that “the Middle Eastern/Arab experience in Europe seemed to reappear quite often” in this year’s entries. Runner up went to University of Auckland master’s graduate, Adam Thorogood’s film Mute, about a mute teenage girl struggling to fit in. The Best Fiction Undergraduate Award was won by Tehran University of Dramatic Arts graduate Arian Vazirdaftari’s film Like a good kid, about a series of events which changes the lives of a babysitter and a young boy forever. “This film stood out for me – the director got a great performance from the kid, and the story was beautifully and harshly told,” Barclay explains. Spanish film school ECAM had two films named co-runners up in this category; Cuarteto and No Odies Al Jugador. The Best Documentary Award went to Israeli film Lido, about an abandoned restaurant by the Dead Sea, by Uri Smoly from The Jerusalem Sam Spiegel Film School. Barclay adds: “Lido was a clear winner for me. It took me somewhere interesting and had a sense of scale.” ECAM entry Concerto Em F was runner up. German film Walls took out the Best Experimental Film. Co-directed and produced by Dortmund University students Maik Schuster, Fatmir Dolci, Max Paschke, Walls deals with the energy generated through human confrontations with walls. Runner up was Lucid from The Jerusalem Sam Spiegel Film School. Australia’s Griffith Film School won the Best Animation Award for Fifty-Two, by honours graduate, Brodie Stephenson, about an employee bound by contract working in an underground station who attempts to find his freedom. Spanish entry Vssanta from Valencia’s Barreira Art and Design School was runner up. All category winners receive NZD$100 prizemoney and a FilmConvert Bundle license worth NZD$320 sponsored by FilmConvert – a Wellington-based company that makes software for filmmakers. Their film emulation and grain plugins are widely used at film schools around the world. * Free Tea/Coffee available all day during breaks. The organising committee for the Uni Shorts International Student Film Festival 2018 is pleased to announce the 24 short films selected to screen in competition at this year’s festival. Spain’s ECAM (School of Audiovisual Cinematography of Madrid) dominates this year’s lineup with four of their student films selected. The Jerusalem Sam Spiegel Film School in Israel also feature prominently with three films selected in experimental, documentary and fiction (undergraduate) categories. Host country New Zealand are also well represented with entries from Victoria University of Wellington and University of Auckland vying for the Fiction (Postgraduate) award, while SAE Institute is vying for the top award in the Experimental category. In the New Zealand Secondary Schools’ category, Life is the Pits, a short film made by Hauraki Plains College students finds itself up against entries from two Auckland-based schools; Acceptance (Kings College) and Intensive Care (Western Springs College). All category winners will receive prizemoney and a FilmConvert Bundle license worth NZD$320 sponsored by FilmConvert – a Wellington-based company that makes software for filmmakers. Their film emulation and grain plugins are widely used at film schools around the world. Entry is free to this year’s Uni Shorts which is being held at the Red Lecture Theatre at Unitec Institute of Technology in Auckland, New Zealand on Saturday, 27 October. For all booking enquiries email festival coordinator Peter Rees at unishorts@unitec.ac.nz. Screenings of all films will take place from 11:30am – 5:30pm followed by an awards ceremony and refreshments. A full programme schedule will be published on www.unitec.ac.nz/unishorts. 28.09.18 - FREE ENTRY to Uni Shorts 2018 – Book Now! 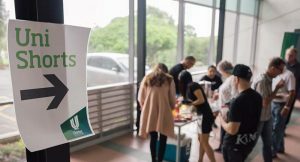 We’re pleased to announce that there will be no registration fee to attend Uni Shorts 2018 which is being held at Unitec in Auckland, New Zealand on Saturday, 27 October. Uni Shorts is the only international student film festival of its kind in Australasia and this year’s event will be the sixth edition since its inception in 2012. This year we received some amazing submissions from universities and film schools around the world. Soon we will announce our finalists in fiction, documentary, animation, experimental and NZ secondary schools categories. So join us on Sat 27 October and watch some great student-made short films and stay behind for the awards presentation to see who our winners are. Tea/Coffee/light refreshments will be provided. To book your seat or to make a group booking email Festival Coordinator Peter Rees unishorts@unitec.ac.nz. Seating is limited so first come, first served. Student filmmakers and schools from around the world are invited to submit their student made films for the Uni Shorts International Student Film Festival 2018. This will be the sixth edition of Uni Shorts which was started in 2012 by film students at Auckland’s Unitec to provide a platform for screening their short film work. The festival has since grown into the largest student film festival of its type in Australia and New Zealand. Short films must be entirely student made and under 20 minutes. Entry categories this year are fiction, documentary, animation and experimental. Early bird entry is only NZD$20 until 29 June 2018. Standard entry fee is NZD$30 by the final entry deadline 3 August 2018. There is also a secondary schools’ category for New Zealand entrants only, which is free entry. This year’s festival will again be held at Unitec Institute of Technology’s Mt Albert campus in Auckland, New Zealand on 26-27 October 2018. 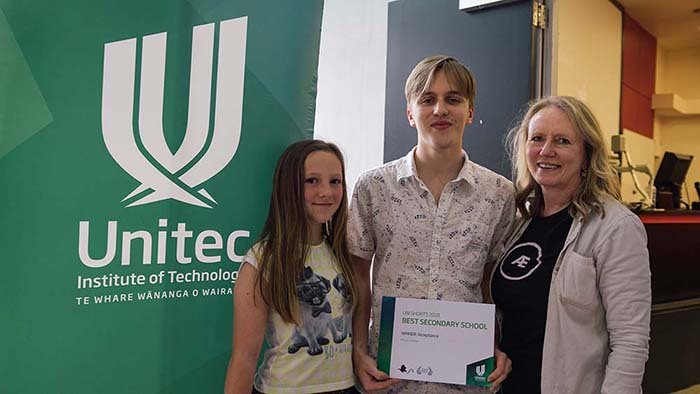 An Awards Night will be held at Unitec’s Red Lecture Theatre on Friday, 26 October where the winners will be announced. This will be followed by a full day of screenings of all finalists on Saturday, 27 October. A workshop for high school students and media studies teachers is also planned for Friday, 26 October prior to the awards evening. Entry to events on both days will be free. The prizes, judging panel and festival programme for Uni Shorts 2018 will be announced following the Call for Entries in August. To enter your film go to Uni Shorts website www.unitec.ac.nz/unishorts or email festival coordinator Peter Rees unishorts@unitec.ac.nz for more information. Happy New Year student filmmakers! Uni Shorts is taking place again this year. We’ll be putting out a Call for Entries soon with entry deadlines, fees and dates for the 2018 festival so stay tuned and get your student short films ready for submitting. Submissions must be less than 20 minutes long and entirely student made as part of a course of study between Nov 2016 – Feb 2018. Entry categories: fiction, documentary, animation, experimental and secondary schools (New Zealand only). A Perfect Child; a film by students at Christ’s College and St. Margaret’s College in Christ-church, has been voted the Best New Zealand Film at the annual Uni Shorts student film festival, a celebration of student film-making from around the world curated and hosted by Unitec Institute of Technology. This year’s Uni Shorts line-up saw thirty finalists across six categories with the winners being named at the opening night of the festival at Unitec in Auckland this evening. The judging panel included award-winning filmmaker Alyx Duncan, renowned actress, writer and direc-tor, Aidee Walker, and internationally acclaimed animator, Katie Naeher. The festival runs from tonight until Sunday, 26 November. The 18-minute long A Perfect Child is the work of around 60 secondary school students from Christ’s College and St. Margaret’s College in Christchurch and tells the story of Ava, a young girl in an orphanage who comes to realise that fellow orphans are being cloned to create perfect children. The film took a year to make, with students involved in every as-pect of production, including writing, directing, casting, costuming and post-production. Di-rected by William Burns, A Perfect Child features an original film score composed by Year 13 student Jeremy Lidstone. A Perfect Child also won the Best Secondary School category with judges praising the Christ-church-based students for their strong premise and depth of talent. Runner-up in the cate-gory was Kapiti College with Black Dog. The University of Auckland dominated the Best Fiction Postgrad category, taking out both the winner and runner-up prizes. In first place was Parasites which tells the story of a young woman fighting pressures from inside and out, pushing her to have children. Judges praised the film for its hilarious premise and solid acting. Runner-up in the category was The Spec-tacular Imagination of the Pohara Brothers. International institutions took top honours in the Best Fiction Undergrad category. Out of Reach from the Jerusalem Sam Spiegel Film School in Jerusalem was placed first with their “poignantly moving, yet simple concept”. The film is about photo shop assistant, Hagar, who in following up customers who have not returned to collect VHS tapes they left to be digit-ised, uncovers a family with a poignant story. The City College of New York was runner-up with Cloud Kumo. A Dutch film, Reconstructing Reality, by the Design Academy in Eindhoven won the Best Ex-perimental category. The judges found it “entertaining and intriguing” and commented on the effective use of multi-split screens and the perfect timing of the film. The New Zealand film – Strike Out – from the Southern Institute of Technology was runner-up in the category. European entries came to the fore in the Best Animation category with Child from the Film Academy Baden-Württemberg in Germany taking first place, and Musicide (Musicidio) from ECIB Escola de Cinema de Barcelona in Spain runner-up. Child drew praise from the judges for its visual style and beautiful construction, as well as its natural animation and effective sound design. Child tells the life story of a child who goes in search of firewood, seeking ev-er more fuel for his fire as he grows into a man. Wolfe, a personal story about a man’s pursuit of peace and respite from a mental disorder, won the Best Documentary category. The film is from the Griffith Film School in Australia and was praised by the judges for its honesty, rawness and simplicity in covering a complex subject. About art, my family & me, from Zurich University of the Arts in Switzerland, was runner-up in the category. Dr Vanessa Byrnes, Uni Shorts festival chairperson and head of Creative Industries at Unitec, praised the quality and diversity of this year’s submissions, saying “Uni Shorts is one of the only film festivals in the world to celebrate student filmmaking and we’re very proud to be curating and hosting this event. Uni Shorts 2017 promo video from Unitec Creative Industries on Vimeo. Entry to Uni Shorts 2017 is FREE. Just turn up! Awards night is this Thu, 23 Nov at Unitec’s Mt Albert campus in Auckland in The Chapel in Building One, Entry 1, off Carrington Rd. Check out this year’s exciting lineup of student short films https://vimeo.com/243586403. Email unishorts@unitec.ac.nz for more info or visit https://www.unitec.ac.nz/unishorts for a full program. Award-winning filmmaker Alyx Duncan, renowned actress/writer and director, Aidee Walker and internationally acclaimed animator, Katie Naeher, have been announced as the judges for this year’s lineup of international student short films for Uni Shorts 2017. Not to be outdone, there is good representation from the host nation with New Zealand tertiary institutions shutting out the international film schools in the postgraduate fiction category. The competition is evenly spread in the animation and experimental categories with NZ and international finalists. The finalists for the New Zealand Secondary Schools category also come from all over the country, from Auckland to Christchurch. Uni Shorts festival chairperson, Dr Vanessa Byrnes says the quality and diversity of this year’s submissions shows that Uni Shorts is gaining an international profile and one of the only festivals celebrating student filmmaking from around the world. Unitec was proud to be curating and hosting this event. 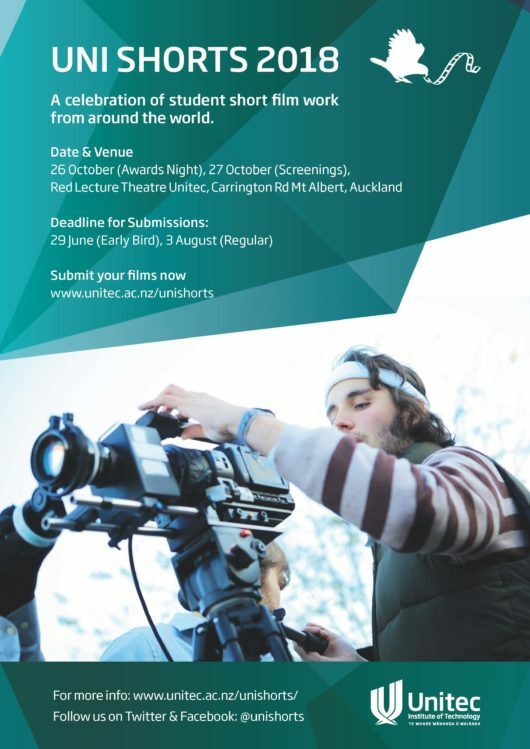 “Uni Shorts is an important forum where Unitec can recognise and catapult international student film making talent. Our exceptional line up of judges are perfectly placed to spot the up-and-coming storytellers in this diverse and exciting medium,” says Dr Byrnes. Entry to Uni Shorts is FREE. To RSVP for the opening awards night at Unitec where the winning films will be screened on Thu 23 Nov @6:30pm email Festival Coordinator Peter Rees at unishorts@unitec.ac.nz. For a full schedule of screenings of all finalists from 24-26 November go to www.unitec.ac.nz/unishorts. Alyx is an award winning filmmaker and choreographer in genres spanning live performance, installation, video-dance, music video, documentary, television commercials, and experimental filmmaking. She has made award winning films – her feature The Red House, screened at NZIFF and won the Best Self-Funded Film at the New Zealand Film Awards in 2012; and her short The Tide Keeper, won The Madman Entertainment Jury Prize for the Best New Zealand Short Film at NZIFF 2015. Alongside her industry work she has taught papers in dance, digital video, and theatre studies at various tertiary institutions in New Zealand and China. Aidee Walker is a renowned actress, writer, and director in the New Zealand film and television industry. In 2014 she joined the writing team for South Pacific Picture’s Step Dave Series 1 & 2, and now has multiple TV series ideas in development with Greenstone TV. Her debut short, The F.E.U.C. (The Four Eyes United Club), was officially selected for the Palm Springs Film Festival in the United States, and Show Me Shorts Film Festival in New Zealand. Her second short, Friday Tigers, was funded in the New Zealand Film Commission’s Fresh Shorts scheme, and upon its release was officially selected for the MIFF, where Aidee was also handpicked to attend the Accelerator Program. Friday Tigers won Best Short Film and the Audience Award at the 2013 NZ International Film Festival, and was a finalist for best short film script at the NZ Writers Awards. Aidee was a finalist in the Woman to Watch category at the 2014 WIFT Awards. Katie Naeher is part of Auckland production company Assembly’s internationally acclaimed character animation team. Her time at Assembly, Oktobor, Blockhead and GameLoft has seen her, and the team awarded at every major show around the world from Cannes, D&AD and most recently with a Webby in New York. Her work on the Penguins of Madagascar TV series, and Kung Fu Panda (Legends of awesomeness) at Oktobor, both received Emmys. Outside of her day job, Katie has been a guest lecturer, served on numerous animation panels and juries around NZ and is also a mentor to interns starting out in animation. Her career highlights include: Heinz “Geoff”, ASB “Clever Kash” and character animation for the ‘Kubo and the Two Strings’ game.